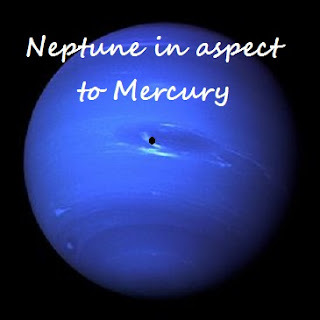 It is important when delineate an aspect between transiting Neptune to Mercury to take a close look at how Mercury is aspected in the birth chart. The natal aspect can either soften the transit or challenge it, regardless of what the current transiting aspect might be. For example, if Mercury is trine to Jupiter, sextile to the Sun and conjunct Venus in the birth chart, any transiting aspect would not be very challenging. If, however, Mercury is square to Saturn, in opposition to Uranus and also square Neptune, this would cause great stress when activated through transit or progression regardless of the transit aspect. 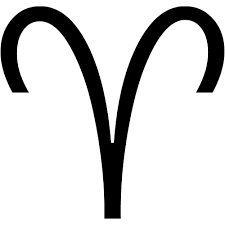 Any aspect to Mercury in the birth chart will also be activated during this transit, especially so if in close aspect by degree of separation in the birth chart. It is also necessary to look at the house Neptune is currently transiting as well as its placement in the birth chart, as this will help define what area of life is being affected. With this information at hand, a conjunction between Mercury and transiting Neptune can be quite difficult to handle. As Mercury rules the mind and thinking process, analytical abilities can be misunderstood or unclear. You can be “way off” in your assessment of a situation and restructuring of your life is not recommended until this transit is over. Decision making can be clouded and if connected to business, you may not be getting the proper information or someone could be deceiving you. Others may also have trouble making sense of what you might be trying to convey as well. On the positive side of this aspect, the mind is now open to the subtle influences of mystical and inspirational messages from beyond. You could experience amazing clarity in vision as your mind is more open to such things. Your intuitive faculties are highlighted and although you might have found something very significant (unless others are in the same vibrational frequency and open to mystical events), you might want to keep this information to yourself as they may simply not be ready to hear what you now understand. The energy of the square between these two planets is similar to when the thinking process is off or vague. Your mental focus will be off, and what you think may be way off as well. It is wise not to make any important decisions during this period as mistakes can have profound effects. You most likely are not seeing things clearly and it is easy to misjudge important matters. Communication with others has its challenges as well and misinformation can be taken as truth and disillusion could be the result. You may also find that you worry about outcomes during this time or feel confused or even depressed. It is important to recognize that this is as a result of the influence of Neptunian energies and the tests that you are experiencing will eventually lead to clarity and understanding. The opposition aspect is often related to misinformation or lost communication with others. Other people are usually involved in the equation. This could involve partnership, family, friends, acquaintances and even co-workers. There seems to be misunderstanding, and you may have quite the time getting things in proper perspective. It is usually about communication or false information and it may lead to actions that are not suggested. You may jump to conclusions or mistrust others. Knowing that this is a possibility is a wonderful tool. The trine and sextile aspects can be very inspirational and offer potential insight into the workings of the subconscious. You may find answers to questions you have been searching for, for quite some time. You may come to understanding the hidden universal language spoken only by a few. This can be an awakening time and is very noteworthy as you can easily recognize the difference between illusion and creative thinking. Dreams could also be inspirational and you could use these tools for writing a book or to going deeper into meditation. You could also share this information with like-minded individuals. This can be quite the magical time and an open mind is suggested so that the information can come through.